On 9 February around 150 people rallied at Wallasey town hall against the wholesale destruction of local services by Wirral council. Lively contingents with banners, flags and placards represented many local facilities under threat from the council, which was meeting inside to ratify the cuts programme. 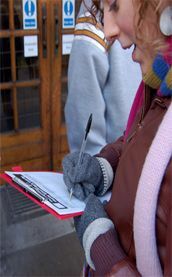 52,000 people have signed petitions against the closures. Despite this, the Liberal-Labour council voted to make all the threatened closures. Wirral residents are supposed to pay the price for economic crisis, central government spending cuts, and mismanagement by those running the council who invested, and lost, millions of pounds in the now-collapsed Icelandic banks. Before occupying the town hall viewing area to follow what passes for 'debate', the rally heard a number of speakers including Dave Lunn, a committee member of Wirral Against The Cuts coalition and supporter of the Campaign for a New Workers' Party (CNWP). Dave demanded: "Instead of making these cuts, the council should be going back to central government and demanding the money we need for our services!" A determined united campaign of mass direct action could still force a U-turn from the councillors. Already, as raised by CNWP supporters and others, anti-cuts candidates are planning to stand in the 2010 council elections. The Tories attempting to latch onto the anti-cuts groundswell makes an electoral challenge even more important. As Dave put it: "The Tories are saying that the people of Wirral will not forget this betrayal by the Lib/Lab council, but equally the people of Wirral will not forget the role of previous Tory governments and councils in destroying our services and jobs. What the people of Wirral want is a genuine working-class alternative to vote for, that is capable of delivering services in favour of working-class communities." In a nutshell, as one person declared to the rally: "What we need is a new workers' party!"